These are probably the must common of all the ice picks. The four flat sides are good surfaces for advertisements. Thus many of this type of ice picks were complimentary to customers. There are probably millions in use today and many still being produced. I don't know of a better place to start than with an example of a square handled ice pick in the original sales packaging. L = 7-3/4", Ice pick has a square handle and a protective cylinder cover for the tine. No markings. USE AS A HOLE PUNCH FOR WOOD, LEATHER, ETC. 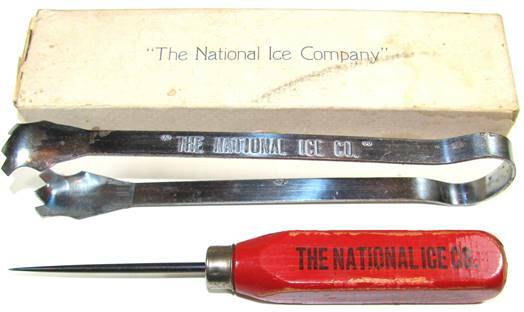 Ice Pick markings - THE NATIONAL ICE CO., REFRIGERATOR CANAN 2463, ICE 1358 CANAL 2423, COAL - COKE CANAL 2371. Ice Cube Tong Markings - "THE NATIONAL ICE CO." on one leg and "SERV - ALL TONG" on the other leg. A set of an ice pick and ice cube tongs with the sales/storage box. L = 8-3/8", The four sides of the handle displays different advertisements and services. L = 8-1/2", JACK DANIEL'S on one side, ENJOY on another side, LYNCHBURG, TENN. EST & REG IN 1866 on another and OLD NO. 7 TENNESSEE WHISKEY the fourth side. L = 8" No ferrule. No markings. L = 7-3/4", Long ferrule. No markings. L = 8-5/8" No ferrule. Tapered with some serrations on the edges. No markings. L = 7-7/8" No ferrule. "MOST MEN GET ONE WIFE BUT THE ICE MAN GETS HIS �� PICK." L = 7-7/8", Bevel on the four edges. No markings. L = 8-1/2", The Southland Corp. green print on two opposite side and red on the other two sides. L = 8", No ferrule, bevel on the four edges. No markings. L = 7-3/4", Phone 54, Geyser Ice Company, WACO, TEXAS, on the handle. J.L. SUMMER, NEWARK, N.J. on the end of the ferrule. L - 8-3/4", GOODELL MADE IN USA stamped on the face of the ferrule. L = 8-3/8", Patented cap lifter attached at the ferrule. L = 9" (top), 9-3/4" (bottom), slightly different cap lifters on end of handle, both cap lifters have three tabs. No markings. A single tine ice pick with a four tine chipper attachment. A guard is provided for the chipper tines. PAT. APL'D FOR on the tine guard. HUBBARD ICE & COAL CO., CEDAR RAPIDS, IOWA plus other markings on the sides of the handle. SOUTHWEST, ELECTRIC, SERVICE, COMPANY - one of each word on the four sides of the handle. The Otis F. Lake & Ice Co. Garfield 40, ESTABLISHED 1899, DISTILLED WATER ICE, ICE COSTS Less - Serves Best and Never Gets Out of Order. On the four sides of the handle.